We took an overnight trip to Chicago. And while shopping on Michigan Avenue (who am I kidding... b-lined straight for Crate and Barrel) spotted B. A. Friend chalkboard place mats. To say I was thrilled is an understatement. They have been carrying them for a few years, but this was the first time I saw them in the store. You can always still purchase them here and here. P. S. My bag is a Kelly Moore Bag. And I LOVE it. It's a camera bag that fits everything! The bag is only 2 pounds which makes it PERFECT for traveling. I didn't take my camera with me on this trip but still carried the bag. Cause it just so happens, to fit all the yarn you need. What could be better! WOOHOO! Way to go! i just love this! super cute bag to boot! so so SO exciting leslie! (also, you've got me thinking about a new bag.) xo. Way to go! Finding that special item is worth the wait. 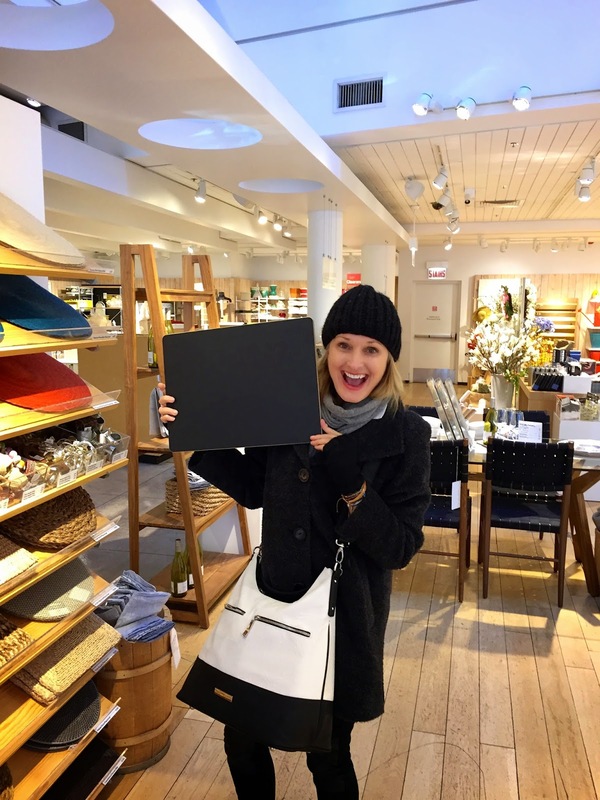 Love that you can purchase the blackboard placemats at Crate and Barrel. I bought two from you for my nieces many years back and they loved them. And finally after several years on my to-do list, I tried your favorite chocolate confectioner's sugar icing last week. What was I waiting for? So easy and everyone loved it. You are so flipping cute! Hope you had a great time and yay for Crate and Barrel! That is a very cute bag. What a fun find. I love anything chalkboard...so creative. Love your bag too...so handy for your stash and your camera. I never knew Crate and Barrel carried your chalkboards...that's wonderful! The next time I go into one of their stores here in San Diego, I'll be sure to look for them. Zu sagen, ich war begeistert, ist eine Untertreibung. Sie wurden ihnen ein paar Jahre trägt, aber dies war das erste Mal sah ich sie im Laden. Sie können immer noch hier und hier zu bestellen.